The Plain Bone Ramekin has the look and the feel porcelain, but is made from melamine. 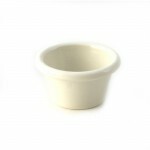 Ideal for portion control of sauces or dips. It has a temperature rating of -22°C to +120°C. The diameter is 7.7cm. Dishwasher safe. Sold singly.